The power of light on aesthetics is profound, and the best ring lights embrace this philosophy. Using a rounded expression of light, shadows are reduced which naturally softens the image. For professional use, or personal preparation, ring lights use geometric precision to evenly distribute the light, and thus the visual it highlights. When the mind registers an image, it is a composite sketch of noted points, with the blanks filled in. Using dimmers and a variety of light to space ratios, the properly used ring light allows control over the seen image. A balance of brightness and heat generated results in product practicality and cost, while the height, range and quality impact the ring light’s efficacy. Originally a beauty product, the ring light imitates the broad luminescent range of natural light, making it a good preparatory option for beauty seekers. With the onset of digital imaging technology, the prolific nature of these lights has expanded to a necessity for amateur and experienced photographers alike. A wide range of products fall under this category, with a variety of skews. A range of available lights, from LED to halogen, shift the brightness and intensity. Dimmers, and supplemental features adjust color and impact. The rings’ shapes make for different light throes, thereby changing the resulting image as a whole. Coming with all the necessities, this ring light clocks in at a broad 18”, making it one of the larger models on the market. Using LED lights, the broad coverage evens out the light dispersal for an effect that softens features. The light stand allows for the ring light to be elevated to suit the photographer’s needs. When extended, the stand exceeds sixty inches, compacting to half that when folded. Running on a power cord, there are adaptors with this set that allow for international use. For professional photographers, or those taking this set on their overseas journeys, this option allows use in any place. The color filter set encourages the maneuvering of the light to best capture the moment. The set is compatible with most cameras and smartphones. Coming with a tripod, the light stand has a clip-on spot for a camera/smart phone. The dimming features cover a full range of options that suit any time of day. With the carry case that comes with the ring light, this product becomes mobile and suitable for an on-the-go photographer. For those starting out, or looking to upgrade their photographical technique, this option is an ideal business partner. An investment in the finished product, the wide ring light encourages appealing and technically correct imagery. Whether for personal or professional use, ring lights are a massive part of the beauty industry due to their in-demand virtues. Allowing for an even flow of light over the subject, the ring acts as a proverbial halo, inducing a pleasant effect on those who fall under its rays. Beneficial when taking pictures of people especially, the softening impact adds a friendly, touched-up aura to photographs. This option dims down to as low as 20% making it better suited for indoor use. With an added cloth to diffuse the light, the soft result contributes to a smooth appearance. Having a variety of setup options and attachments, this indoor light can be used for multiple purposes. Due to its size, a good option is an indoor studio setup. As with most ring lights, there is power cord charge. Setting this light apart is its use of fluorescent lights for low heat. Whether doing a makeup tutorial or a photoshoot, heat from a light can cause pesky humidity on the subject. The low heat of fluorescent lighting mitigates this risk and provides a low heat option. The only downside is that some do not react well to the sound of fluorescent lights, so if this is a concern, an LED option would be preferable. Ideal for those with a tripod, this product is designed for experienced photographers with existing technical gear. The professional focus of the item gears it towards those who are already established in the industry and encourages career development. Ideal for bathroom counters, tables, or desks, this miniature model is a petite interpretation of the photography and beauty product. Making this lighting technique accessible to anyone, this LED ring light comes in a variety of product sizes, with 6” being the largest option. 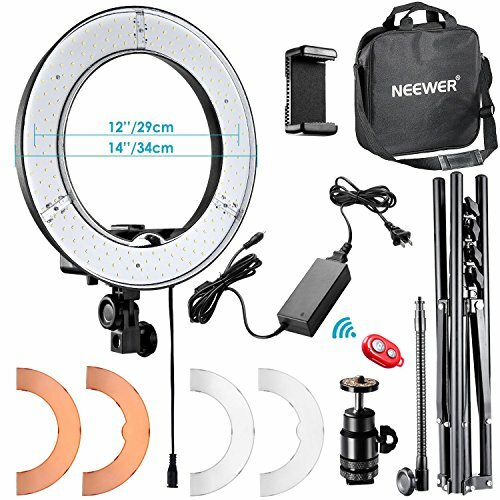 For those just starting out, this low-cost ring light is a perfect option to get acquainted with the technique. Though small, this product contains all the necessities including a cell phone holder that is compatible with most modern models. Making it very usable, the user can get acquainted with techniques associated with light management in imagery. As for lighting, four distinct hues are highlighted. The bright white and yellow use their boldness to contrast against soft features. Warmer options of the two colors soften otherwise harsh characteristics. The USB powered system makes this highly portable item usable for any room or setup. Lightweight and easy to carry, this is a model suitable for travelling and more mobile photography. While powerful lights can allow for a highly enlightened image, they are also vulnerable to overproducing heat. Too much heat both aggravates subjects, and adds moisture through perspiration, actively degrading photo quality. While some heat loss can always be expected as a law of physics, the difference of even a couple hundred Kelvin (K) can make a significant impact. To prevent these possible pitfalls, this light edges up to a maximum heat of 5400K, allowing a cool environment during photo shoots. Ensuring no ultraviolet radiation, this option was created as an environmentally friendly option. Low carbon impact through limited power uptake and reduced heat emissions make this an ecologically sound product. Having all the standard amenities including a smart phone holder, and the necessary white and orange filters, this product checks all the needed boxes. As an added feature, the Bluetooth connection allows for the remote command of the camera. The adjustable stand allows for the light to shine at any desired angle. Highly compatible, this product works with most popular makes and models of smartphone. 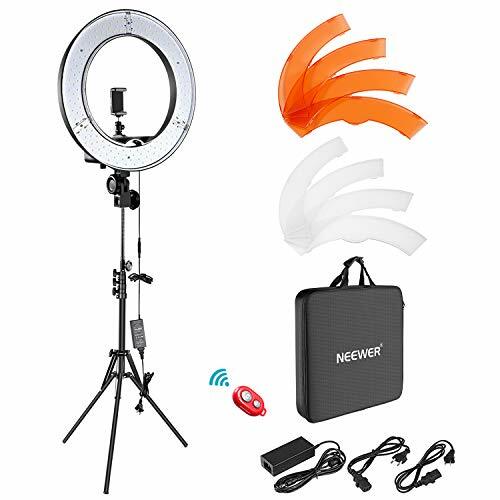 Medium of size, this 14” diameter (external) and 12” (internal) ring light is a good starter kit, coming with all the necessities for a newly established photographer. Promoting soft lighting, this low-cost option is made of aluminum, a metal valued for its safe heating properties. Coming with a tripod head, there is a wide range of angles available to this setup. The full range of dimming makes this option suited to any situation, outdoor or inside. Traditionally, art studios had limited use because proper sunlight was only distributed properly in the area for a certain period of the day. The modern feature of the ring light allows any room to be a studio and ensures no time limit with the rounded luminescence. This compatible option comes with a carrying case, making it highly portable and ideal for apartment or condo living. When considering medium to large options, storage becomes a factor. The compactable nature of this option makes it easy to keep in even a small space. Due its heat dampening impacts, this ring light sees a long shelf life of over fifty thousand hours. This translates to the light being able to run for over five and a half years straight. The sleek black color adds to the professional appearance. 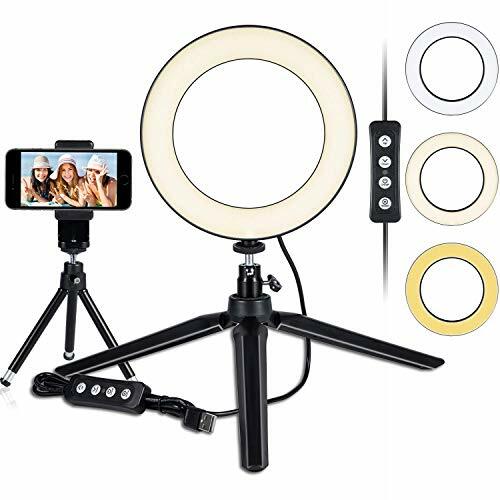 Being a safe and reliable product, this ring light is ideal for those with budding digital photography businesses. One of the biggest downfalls of technology is overheating, posing a risk to fire safety and to the tech itself. In order to mitigate these risks, low temperature lights allow for a long lifespan and minimal cost to maintain the product over the long term. This dimmable ring light is another portable option that is suited to travelling, or nature photographers. Compact features promote this item’s light weight that makes it a friendly companion for those on the go. The focus of this model is function, and for each of the 360 degrees of the circle, there is a beaded LED light, literally maximizing quality. Even distribution at the maximum tangent frequency on the circle embraces the full desired effects of the ring light itself. With a soft tube, this light allows for rotation to all angles. Though highly embedded with bead lights, this product is on the smaller end of size, at an internal diameter of only 9”. The size is a direct trade off for the light quality, both being a factor of heat. This aluminum model is safe and reliable allowing proper dispersal of heat and for the product to not burn-out. This design is best for situations with existing ambient light due to the smaller size of the ring itself. With the 60% of America’s population living in multiple unit homes, according to NMHC , the need for compact products has never been higher. For a small, yet highly utilitarian ring light option, this 8” light is a suitable choice. Perfect for apartment or condo living, this high-quality lighting solution is simple to set up and easy to store. Using 120 LED beaded lights, this product covers a 1/3 range in terms of light quality potential. However, with the small size, the reduced ration of light to space still provides adequate lighting. Given the smaller size of the product, it can be kept up in even the smallest quarters. Good for tables, desks, and counters, this was built for online videos and is suitable to those vlogging from home. Completely dimmable with broad rotating features, this compact unit is made of aluminum, so it is safe for indoor use. An additional benefit of the small size, over and above the mobility, is the extensive shelf life of the produce itself, resulting from the minimized wear and tear from heat. Good for self-generated photos, this is ideal for a one-person operation. Easy setup, coupled with an accessible phone holder and universal compatibility, make this product a good solution for an independent businessperson. A well-designed product, this is a comfortable and small investment suited to getting a new endeavor off the ground. Most professional products are surprisingly simple. Time is money, and any unit with the ability to reduce maintenance and setup expenditures is a business benefit. 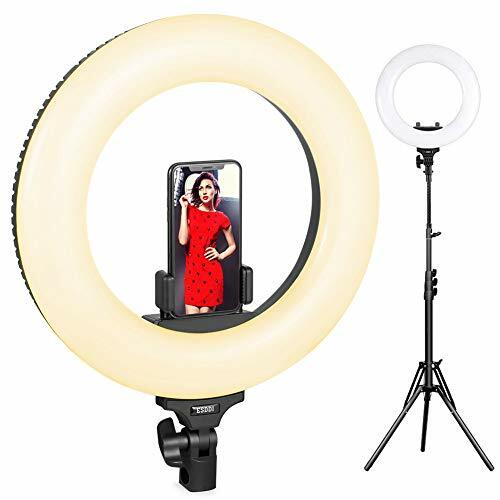 Suited to a photography studio, this ring light holds a long stand that brings both a professional appearance and purpose. The 12” light is a medium range option that is supplemented by the height of the lift, reaching roughly eighty inches. Aluminum alloy makes for reduced thermodynamic wastage and is low-cost due to the power required to operate the machine. The industry standard white and orange filters allow high quality images amenable to any ambient light. A suitable solution for those looking to establish a photography business that deals with clients, the sleek appearance and professional setup gives a commercial purpose. 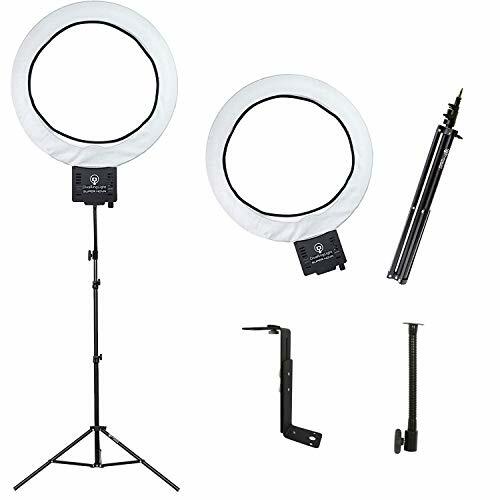 The sizeable nature of this ring light rules it out for personal use, while making it a perfectly viable business option for any photographer. For established photography studios with several existing clients, a large sized ring light is a good way to scale up the business. The tone of professionalism increases client comfort and trust, both distinct factors in return consumer generation. A strong frame gives this product a good backbone to minimize the damage of potential wear and tear. Particularly good for those working with children, this sturdy design can withstand pressure and weight up to eleven pounds. While not designed to be thrown off a high rise, this product is offers unique resistance to damage. Designed as a user-friendly product, this ring light saves time for the photographer, maximizing potential client turnaround. With a two-meter stand, the height allows for broad application of the light itself for wide coverage. The high-quality LED lights have 240 beads within the ring, a ratio of roughly 2/3 light to space. This feature promotes a low temperature for a comfortable studio, necessary given its size. Bluetooth compatible, the mobility of the photographer is maximized with proximal ability to take pictures. 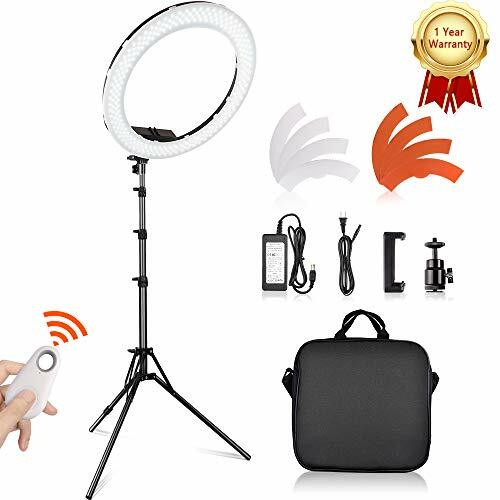 Coming with all the standard necessities, including power adaptor and carry bag, this ring light has the expected white and orange filters. The light itself is designed to promote the popular ‘halo’ impact in the eye. The limbal ring, the dark circle around the iris, is often regarded as a touchstone of beauty in cultures across the globe. Through the light ratio of the ring light, the limbal ring is highlighted and beauty is enhanced. Beauty oriented imagery benefits the most from this option, given its design to embolden and soften distinct facial features. While this makes the setup perfect for in-person imagery, the design is not geared towards still life. Long before the onset of digital photographic application, the value of the ring light was established. The proper appropriation of luminescence was viewed as an indoor imitation of daylight. These items have long been popular for their personal beauty applications. This 6” ring is ideal for personal use, and dims to the maximum extend making it suitable for any existing lighting. 64 light units of LED beads give offer a sound brightness with a suitable distance between beads for safety. The trio of colors allow for diligent checks of appearance against any lighting. The warm white imitates daylight, standard light mimics indoor fluorescence, and the yellow light spans dimmer situations. By checking against these three filters, the user can be confident of their appearance in any situation. Though small, this option can also be used for digital photography, with the full range of products associated with professional ring lights included. The mount affords a wide range of rotation, and the USB powered unit makes easy usage of the item. While usable for online promotion and video blogging, the selfie stick adaptation of the mount highlights this product as best for personal use. The structure of the product will directly impact where it can be stored and used. Models range from 6” to 18”, without considering the lift stick. Though most items have a carrying case, the usability of the ring light will be directly proportionate to its accessibility. Considering the amount of space available, and setting clear intentions for the light’s purpose, will help to determine what size is the most suitable. The light’s range will, of course, be influenced by size and height. If the light is going to be used for professional purposes, a longer lift and larger light is desired. However, if the ring will be dedicated to the art of selfies and personal, small scale vlogs, a large size is seldom required. Most options are lightweight and easy to transport, something that is ideal for those on the go. Many freelance photographers take their entire setups with them, and a less heavy product makes for easy maneuvering. Naturally, the heaviness of a product can reflect its durability. For those whose photographic concerns are subject to wear and tear, such as nature enthusiasts or children’s photographers, a heavier product can impact the shelf life of the ring light. Mobility is always required, but the photographer should acknowledge the potential risk and weigh the options of a lightweight yet sturdy item. The best solution is proper storage of the item, and an easy to use, compact design can promote shelf life, simply by keeping the light out of harm’s way. 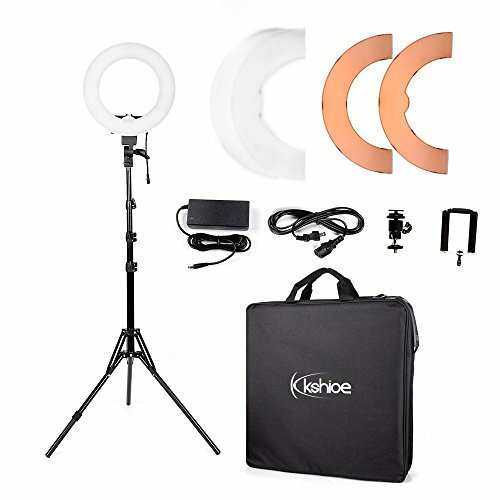 Luminescence is the set goal of the ring light, but the intensity of light is directly proportionate to the amount of power required, and therefore the cost of use. For the cheapest options, an option that fully dims is ideal, so that the downtime power costs can be mitigated. Heat, of course, is another concern that causes subjects to be uncomfortable and grow impatient. Savvy photographers know that the heat generated by lights can cause perspiration that impedes on image quality, especially when dealing with makeup and beauty tutorials. For this, a light dampening, low heat output is ideal. The range of 5500K is acceptable for both the pocketbook and the subject’s comfort. As with most products, especially technologically oriented ones, shelf life is a concern. Lower demand lights with a broad range dimming option promote long term use of the ring light product. The less maintenance required, the more benefit is gained from the product. In terms of lightbulb lifespan, a good timeline is 50,000 hours or usage, with some models being closer to double that amount. Depending on the purpose, the wear and tear on the item will vary. 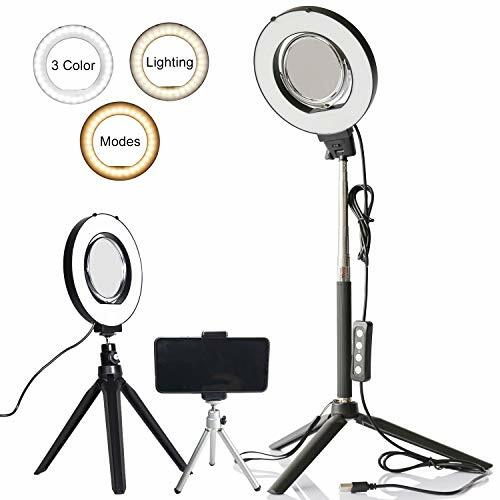 Years of personal use can be extracted from any model of ring light, though the demand placed on professional items will, of course, drain the lifespan of the lights themselves at a quicker pace. The lower heat generated, the longer the user will get from the product. As with any item, the more care given to its safety and maintenance, the longer it can be expected to stay in good condition. I am a photographer. 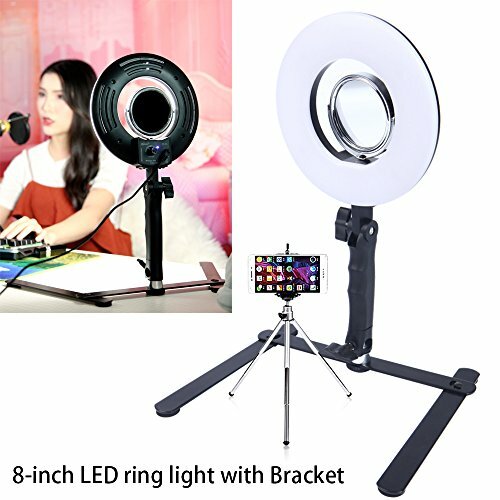 Why do I need a ring light? These lights are popular because they broadly distribute the luminescence, allowing for an ideal, shadow resisting image. Personal use is typically to imitate prime outdoor lighting conditions for beauty preparation, whereas professional use is to get the idyllic illumination of the subject, at any time of day. 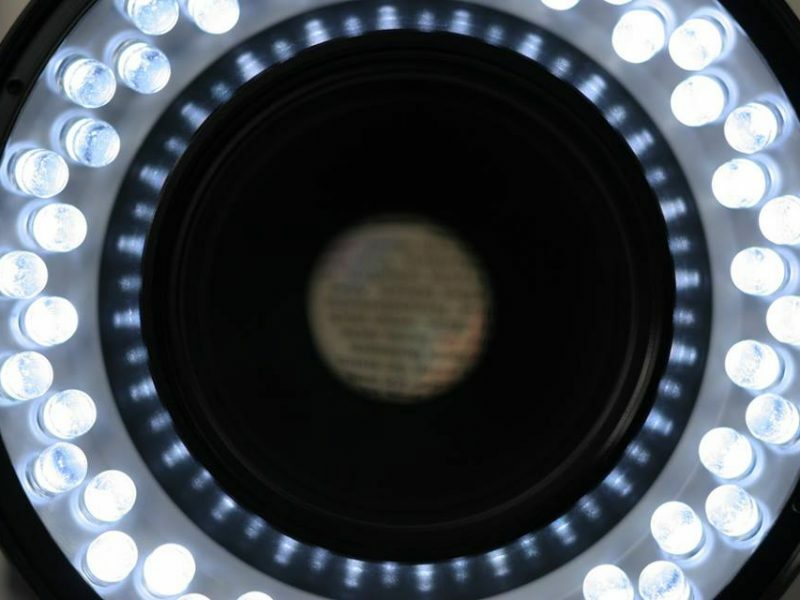 For those seeking technical excellence, or professional success, the ring light is a staple. How do I store my ring light? Typically, there will be a carrying case that comes with the item. Those with an established studio or dedicated room can generally leave their setup intact. For many who use the miniature models, the compact size allows them to become an established part of the room in which they are placed. Avoiding moisture and keeping the product clean will shore up the longevity of the light and its components. When away from the studio, turning off the light is a solid damage preventor. If travelling and not bringing the unit, it is best left unplugged. Can I replace the lights inside? The lights inside of the ring are not designed to be replaced, due to the extremely small size of the beads themselves. While the bulbs cannot be switched, there are options of replacing the ring itself, without getting the entire setup. Light changes are not often a concern given the long usage capacity of LED lights. Generally, even the larger options can run in excess of 50,000 hours or 5.5 years. How do I use the different light settings? The hues operate in one of two ways. The first option is interchangeable filters that can be simply slid on and off the ring to change the ambient hue. The second method of light change is a button-based setting allowing for the light to change. Reading and following the item’s instructions will make clear how to change the hues. In terms of technique, practice makes perfect. There are a variety of webinars available for the aspiring photographer, but nothing replaces experience. A good starting point is striving to eliminate facial shadows on close-up imagery. From there, experimenting with light settings and angles can generate a comprehensive portfolio of photographic options. Why does Bluetooth setup matter? This remote technology allows for the taking of a photo at a distance. Perfect for a one-person show, this tech is great for modern photo sharing applications. Instead of needing to be at the smartphone to take the picture, or setting a notoriously frustrating timer, the ring lights with Bluetooth compatibility allow the image to be captured so long as the user is within the device’s range, typically around thirty feet. Most modern smartphones have Bluetooth capacity as well as quality cameras. The power and impact of light on perception has been studied extensively for centuries. It is no mystery that to imitate the organic benefits of natural sunlight, the shape and technique need to be replicated. For this, the circle is a clear front runner, with its infinitely angled viewpoints that soften images and prevent shadows. Newer users will reap the most benefit from the smaller options that will allow the gain of experience in technique. 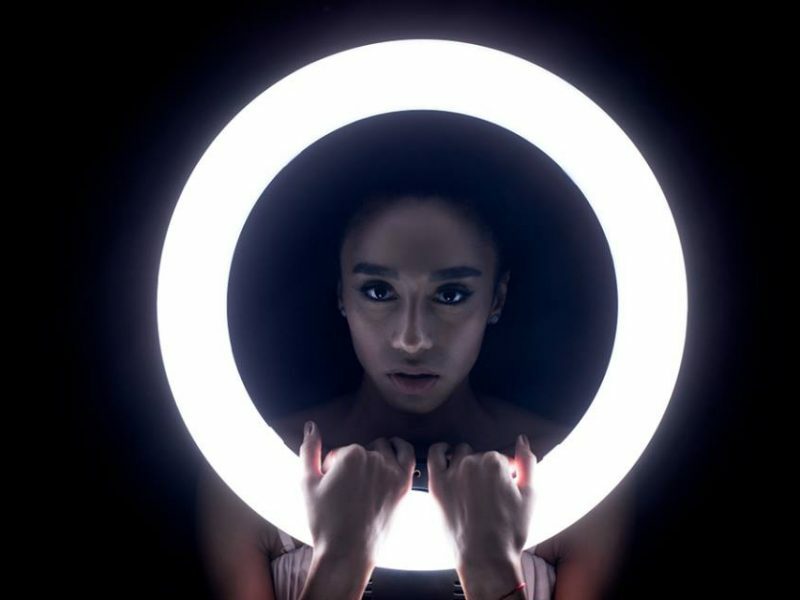 With the prevalence and popularity of digital photography and videoing, ring lights can set apart from the crowd the artistic project, thrusting an amateur into the status of a professional. Those with extensive camera experience or education, ring light technique is clear. Benefit is seen most from the longer sticks, maneuverable tripods, and larger models. Bringing a level of professional credential to the independent photographer, the proper, higher-end ring light can be the best solution to scaling up a business. Encouraging broad hours, the light is a good economic partner as it extends working hour potential to long past prime daylight hours. The study of light and the study of sight are inherently intertwined. Through the proper use of the ring light, perception, and even mood can be impacted. The influence of visual arts is profound in its provision of an expressive outlet where words are insufficient. 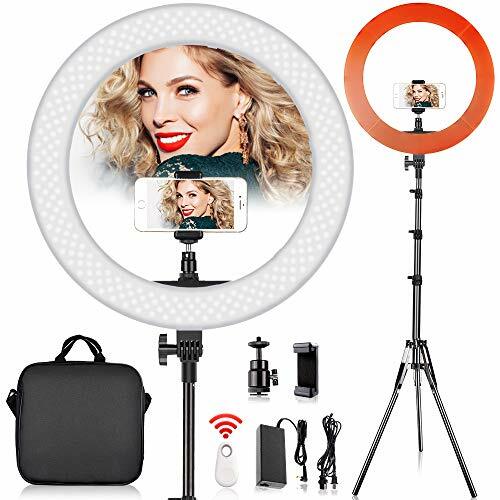 Whether the purpose of the ring light is for business growth and financial gain, or simple self-esteem through looking like one’s best self, the ring light has its benefits rooted in well-established science. Over the course of this review, the qualities and potential drawbacks of ring lights have been detailed. Generally, this is a very accessible tool that fosters growth amongst amateurs and professionalism amongst vetted photographers. The value of the product is associated with its aesthetic impact. For experienced professionals, this is a highlight of what is new and best on the market, factoring in modern technological leaps. Whether it is time to step up to a new level of lighting, or a reminder of the importance of quality on final product, ring lights hold a valuable place in the professional photographer’s life. Amateurs, or those recently established in the photographic industry, can start small and work their way up to the more intense models. Given time and practice, amazing, premium images can be achieved. With billions of worldwide internet users, now is the perfect time to learn photography. Ring lights, especially small or medium models, are a perfect way to get a foothold in the industry. There are options for everyone, and following this advice, finding the perfect ring light has never been easier.